Long before smoothies and Frappuccinos there was the Slurpee. The slushy, colorful 7-Eleven brand - and American icon - turns 40 today and is still popular for the same reasons it caught on back then: fun, variety, "brain freeze" and colored tongues. Thanks for the tip! I checked our neighborhood store and they are offering 7 oz samples and one of the flavors is Blackberry. My all-time favorite flavor remains Coca-Cola but I'll try something new today. I've never had the privilege of tasting a Slurpee, but that they're celebrating the 40th anniversary makes me smile...... If I'm not mistaken, the Italians have been scraping ice from large blocks into cone shaped paper containers and pouring over that a variety of fruit-flavored, herbal and even liqueur based syrups for at least 400 years. Heck, first time I tasted one of those (and fell in love with them) was long before 7-11 was a gleam in daddy's eyes. And yes, in the USA!!!!! Oooh, I should walk up to the 7-11 for one! I haven't had one in ages, but they've always been one of my favorite brain freeze treats! At one point, my favorite was a "smurf" slurpee - pina colada on the bottom, blue raspberry in the middle, pina colada on top. 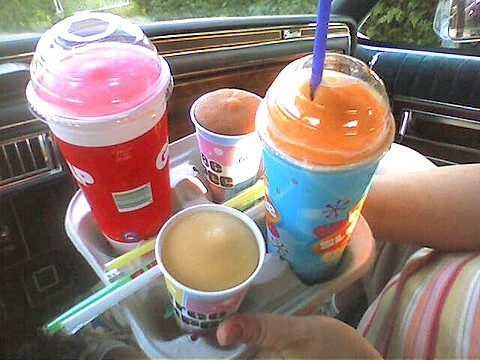 Here's some Slurpees we had on the way back from New York City today, including the free ones in the retro cups. Ooh, that just made me thirsty for a blue raspberry brain freeze. 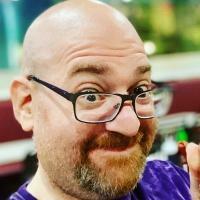 Jason, this updated site is wonderful! It's my first official day here as a poster, and I'm delighted with everything I see. I look forward to exploring every corner. Thanks for joining up, Jennifer! We've got lots of upgrades and improvements in store. I never really liked Slurpees, always tasted to chemical-y to me. Dairy Queen Mister Mistys, however, are fabulous. Of those four, the only one I could stand was the Coke. The pink one was a sour watermelon that was just way too sour and sweet. The orange one was some kind of Hawaiian punch flavor, that just tasted sweet with no actual flavor. That icky beige one is Mountain Dew. I hardly ever have Slurpees, when I do, I like to mix the Coke and Cherry if possible. But, mostly, I think I've outgrown them. I'd much rather have a snow cone with a good fruit syrup. My first and best memories of slurpee's are of growing up in Ft. Lauderdale. A day at the beach with my parents always included a stop at 7-11 on the way home. ( same with trips to Sanibel Island). To this day, a beach trip isnt complete without a slurpee afterwards. This worked for me when I lived in Long Beach, Ca, but doesnt work now as the nearest 7-11 is in London, ON. Oh well, Im sure its a lot healthier for me, if not as fun. As discussed in this topic - I find the Dairy Queen Mr. Misty's way too chunky... and the American Slurpee is way too... airy. Now... here in Canada they are just perfect - right in-between . That could be why Winnipeg is the Slurpee capitol - they are so good here we can't get enough of them. I always look at all the purple, pink, green, blue, etc. slurpees and think "ooo... pretty... must make a layered slurpee with all flavours". Then I realize that I just prefer the pepsi or coke. I've been trying to stay away from sugar lately - so I've tried the Crystal Light 'no sugar added' flavour recently.... amazingly it's much sweeter than the other flavours and I just can't drink them! I wish they could tone down the sweetness so I could enjoy them more often . Hear, hear! (or is it here, here...) Coming from the north (Michigan) where the Dairy Queens closed for the winter, I was delighted to find when I moved to Oklahoma that they were open all year. Sadly, over the last ten years or so, all of them have closed in my town (Norman). I have to go home to visit my parents in the summer to get a Mr. Misty cherry float. Yum! I have a friend, Quentin, who lives in Norman. Is the town small enough that you all might know each other? I loved Dairy Queen when I was a child, and like Slurpees today--the best way to make one is to mix flavors. Us some Coke or the Blue one as your base, and then mix and taste 'til you get it the way you want it. Don't think the children and I have ever had one with only one flavor. I posted my last post and then went in to the kitchen to take a look at the local newspaper (Winnipeg Free Press). Two guys were on a mission yesterday to buy a Slurpee in every (49) 7-11 stores in Manitoba. Here's their website . I told you we liked our slurpees/slushies here. I haven't had one since the mid-80s when I lived in the Slurpee Capitol (Winnepeg), maybe I will try one again. The scary thing about slurpies in 3rd world countries is that you can't ever be sure if they actually used purified water or if the water is contaminated with amebiasis or some other nasty parasites or something. When they first came out, Slurpees were a revolution. I found that it is best to use the spoon/straw ONLY for stirring. Never for slurping. The spoon end is OK for scooping. It is best to stir/shake the slurpee until it is at a level at which it is possible to cease stirring and discard the spoon/straw. Shake it the rest of the way down. Same with a Slush Puppy. You should print this out and keep a copy in your glove compartment. Pam: I swear I just read somewhere that Winnipeggers drink more Slurpees per capita than anyone else on the planet. "It's been a tremendous success story in Canada. You won't believe the amount of Slurpees we sell in Winnipeg in the middle of winter," said 7-Eleven Canada's Mr. Waldron. Malcolm, I know... We LOVE our slurpees around here. That's not even takign into account how many 'slushes' are sold at Mac's Sev even gives out bumper stickers about it being the Capitol. The statistic I heard was that each 7-11 in Manitoba sells an average of 8500 Slurpies per month ... which is the most of any region 7-11 services. What I find fascinating is considering the winters in Manitoba (when I wouldn't think there would be a lot of Slurpies consumed - Pam?) that means the consumption in the summer months is even greater! Oh no my friend. We're hardy folk. I doubt the consumption is as high during the winter, but we don't stop drinking them when the snow falls... could you imagine how many we'd have to drink if it was only during warm months?? Umm... I think we are so used to cold weather it doesn't really matter. Plus, nothing soothes my throat when I have a cold as well as a forzen bev. I had an Icee once at a movie theater and it was the nastiest thing I've ever ingested. The last Christmas I spent in Winnipeg with my ex, he insisted on getting a Slurpee after dinner. It was -25! Me, being the born and bred West coaster, thought he was absolutely insane. In fact, it's perfectly normal there. A very strange group.